A sense of fashion in one click. Trendy and latest designs of different brands,colours,styles and sizes for men,women and kids at a good price. Crepe fabric is a fabric made of silk, wool, or polyester that has a gauzy texture and has a crisp and crimpy appearance. Gold plated meena work bangle bracelet comes with faux pearl.Fancy style kada for that ethreal charm.Ideal for young demure bride.Beautiful bangle that can be worn at all parties & wedding occasion.Bracelet has hinge to open at one end to fit bigger hands. Gold plated meena work bangles comes with cz stone.Fancy style bangles for that ethereal charm.Ideal for young demure bride.Beautiful bangles that can be worn at all parties & wedding occasion.Absolutely newly design & very popular for this season. Gold plated peacock design meena work bangles comes with cz .Fancy style bangles for that ethreal charm.Ideal for young demure bride.Beautiful bangles that can be worn at all parties & wedding occasion.Absolutely newly design & very popular for this season.Beautiful product to gift. One gram gold formed bangle bracelet with Ruby emerald.All stones are simulated & nice finishing.Absolutely barnd new, latest trend & very popular in this season.Fancy style thick kada for that ethreal charm.Bangle comes with key to fit all bigger hand.Beautiful bangle that can be worn on all occasion. Gold plated peacock design meena work bangles polki pin screw comes with cz stone.Fancy style bangles for that ethreal charm.Ideal for young demure bride.Beautiful bangles that can be worn at all parties & wedding occasion.Absolutely newly design & very popular for this season.Beautiful product to gift. One gram gold formed bangle bracelet with faux Ruby emerald.All stones are simulated & nice finishing.Absolutely brand new, latest trend & very popular in this season.Fancy style bangles for that ethreal charm.Beautiful bangle that can be worn on all occasion. A perfect accessory for dresses like sarees ,lehenga and salwar. Beautiful design cz studded with gold plated kundan set.All stones are simulated,nice finishing.This necklace has a eye catching different design.Earrings comes with post back finding for pierced ear.Necklace comes with adjustable cord to fit all neck size.Its a master piece of the artistic hand work.Absolutely brand new , latest trend & very popular this season.Ideal for young demure bride.Beautiful necklace that can be worn at party & wedding occasion.Beautiful product to gift for your beloved one. Gorgeous one gram gold plated pachi kundan necklace set with matching earrings.All stones are simulated & nice finishing.Earrings comes with post back finding for pierced ears.Very unique & beautiful style shiny necklace set.Indian traditional style in gold plated handcrafted with high quality AD kundan.Absolutely brand new latest trend & very popular in this season.A classy collection for the young demure bride.Very good for all parties & occasions.Ideal gift for your beloved one. Beautiful design cz stone studded with gold plated kundan set with maang tikka.All stones are simulated,nice finishing.This necklace has a eye catching different design.Earrings comes with post back finding for pierced ear.Necklace comes with adjustable dori to fit all neck size.Its a master piece of the artistic hand work.Absolutely brand new , latest trend & very popular this season.Ideal for young demure bride.Beautiful necklace that can be worn at party & wedding occasion.Beautiful product to gift for your beloved one. Beautiful design red stone studded with gold plated pachi kundan set.All stones are simulated,nice finishing.This necklace has a eye catching different design.Earrings comes with post back finding for pierced ear.Necklace comes with adjustable dori to fit all neck size.Its a master piece of the artistic hand work.Absolutely brand new , latest trend & very popular this season.Ideal for young demure bride.Beautiful necklace that can be worn at party & wedding occasion.Beautiful product to gift for your beloved one. Absolutely newly Designer Gold tone maroon & white kundan studded jewellery set with maang tikka.All stones are simulated,nice finishing.This set is unique in its design & will definitely make you feel special.Earrings comes with post back finding for pierced ears.Necklace comes with adjustable dori to fit all neck size.Absolutely brand new latest trend & very popular this season.Ideal gift for loved one.Very good item for all occasions & parties.Beauti ful product to gift. Absolutely newly Designer Gold tone red & white kundan studded with cz jewellery set with maang tikka.All stones are simulated,nice finishing.This set is unique in its design & will definitely make you feel special.Earrings comes with post back finding for pierced ears.Necklace comes with adjustable dori to fit all neck size.Absolutely brand new latest trend & very popular this season.Ideal gift for loved one.Very good item for all occasions & parties.Beautiful product to gift. Enchant The Mantra Of Being Stylish In This Attire. Be The Center Of Attraction With This Beige Brown, Black, Deep Pink Brocade, Jacquard & Velvet Salwar Kameez. The Lovely Bead, Bugle Beads/ Cutdana, Lace, Multi & Resham Work A Substantial Feature Of This Attire. Brocade Might Vary From Actual Image. Aspiring To Make A Mark In The World Of Style! Here Is The Attire To Breath Life Into Your Aspirations. Get The Simplicity & Grace With This Black, Brick Red & Ivory Faux Georgette Salwar Kameez. The Ethnic Lace, Multi, Resham & Stones Work On The Attire Adds A Sign Of Beauty Statement To Your Look. Rich Look Attire To Give Your A Right Choice For Any Party Or Function. We Unfurl Our The Intricacy And Exclusivity Of Our Creations Highlighted In This Lovely Deep Purple Velvet Salwar Kameez. The Bead & Stones Work Personifies The Entire Appearance. Get Going With This Majestic & Wonderful Piece And Make Your Dream Attire Look Richer To Your Persona. 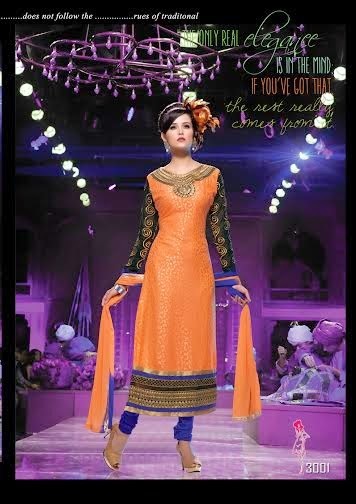 This Gold Color & Navy Blue Faux Georgette Salwar Kameez Is Accenting The Gorgeous Feeling. This Ravishing Attire Is Amazingly Embroidered With Bead, Lace, Multi, Resham & Sequins Work.